Let me take a step back in case you haven't heard of Stitch Fix. It's an online personal stylist. You fill out an online profile sharing some of your style likes and dislikes. For instance, it will show you a collection of clothes and you can say how much you like that set of clothes. You can also indicate a price range and share other lifestyle preferences such as whether you need clothes for work, casual, or a special occasion. Once you have your style profile completed, you can select a date for your box to be delivered. A stylist reviews your profile and will send fives items for you in a box. You don't have to subscribe; you can opt to have it as a one-time box delivery. The shipping is free and they give you a pre-paid package to send whatever you don't want back to them. You can try all the items - clothes, shoes, jewelry - on at home and send back what you do not want to keep. That said, if you keep the box you get a 25% discount. If you keep anything, they give back the $25 style fee to you. So the risk of losing money is pretty low - I bet you can find one thing you like in the box! The anticipation for your box to arrive in the mail is always fun. Better yet, you don't have to go shopping, which can be tough if you have kids. I used to love shopping, but now I find it hard to get out and if Caleb joins it's always a bit of a headache. I've done enough "talking" and let's see what I got, shall we? What I got in my Box. 2. Full Moon Stapleton Maternity Knit Tank - I totally dig stripes. Josh makes fun of me for it. But the seller on this top for me is the back. 3. Prosperity Tabetha Maternity Capri Skinny Jeans - I had to exchange these for a smaller size, but no problem. They fit great and I like the under the belly style (for now). 4. Lux & Co Brendan Maternity Raglan Sleeve Knit Top - The different patterns between the main part of the shirt and sleeves add a nice twist to this top. 5. Gorjana Chloe Small Stud Earrings - I would have preferred another top (should have noted that to my stylist), but I do think I'll get good wear out of these earrings. I can't wear dangly with kids since they want to play with them - ouch! Side note: It's surprisingly very hard to take a picture of your earrings in your ears by yourself. Sorry for the "ehh" photo. The Stylist Outfit + Note and Packaging. This sheet comes with the package to show you the pieces, how to style it, and a personalized note from your stylist. I love the cute touches with the branding and delivery as well. Perhaps you're curious as to what I received in my maternity box during my last pregnancy. Well, I grabbed the photo from my personal blog to share. I'm wearing all these pieces again during this pregnancy, which is also a good sign of the quality of the pieces. And now I'm happily wearing all my new maternity clothes! Have you tried Stitch Fix before? If not, here's my referral link. Yes, I do get some sort of reward for referring you, but that's not at all why I wrote this post. 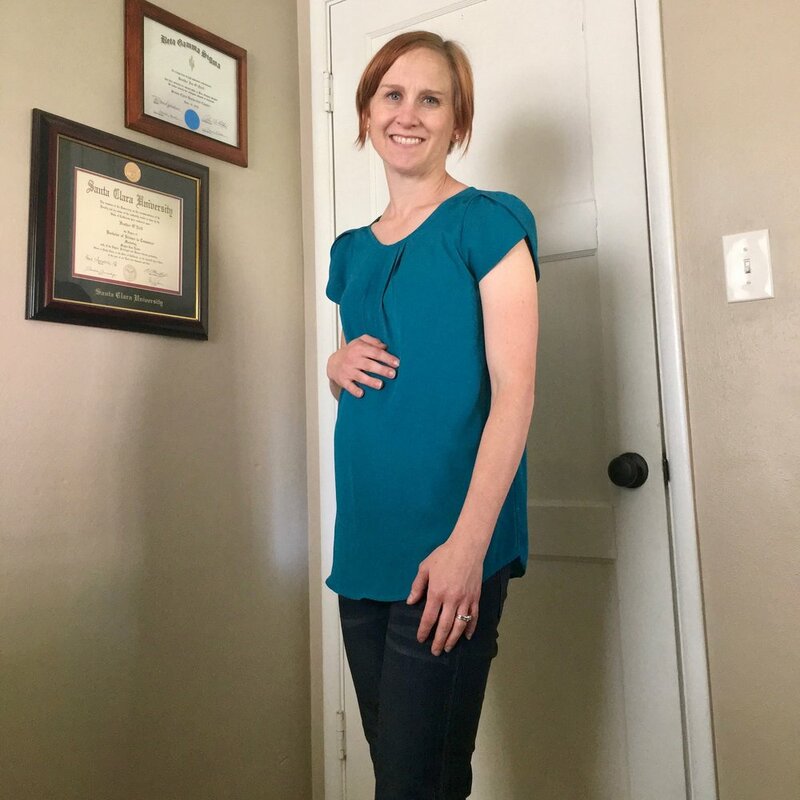 I simply wanted to share my good experience with Stitch Fix Maternity and also to tell you one of my ways of getting clothes while raising a toddler (hint: it's not so easy).